Discussion in 'ABF Freight System' started by Muler, Apr 23, 2018. Here it is the things that can or will happen with our pensions with this vote. Lets look at what a yes vote can do for our pensions and out Health insurance. First a yes vote will freeze the contribution rate that abf pays at the rate on the closing date of March 31,2018 that is right the only part of this contract that retro's back to the END OF OUR REAL CONTRACT. This means that if you are in a fund that requires a increase on or after April 1,2018 your pension will go into default status. By voting yes you are subjecting your pension to sever cuts. It is true in the case of Central States they have not ask for a raise since 2011 and that in it's self is bad news but it did not cause a default status because no increase was required. If this contract passes as written here is what can happen. Your pension will be drastically reduced, you will lose your DEATH BENEFITS,you will lose your DISABILITY BENEFITS, Then comes the killer if this contract passes as written you can lose all your health benefits when you retire. THAT'S RIGHT I just got off the phone with Central States and here is the formula i was given on the requirements to receive health insurance when you retire. First off you must have paid into the pension fund for at least 20 years. Secondly you must have paid into the pension fund for at least 7 out of your last 10 years of work. And third you must have paid into the pension fund for at least 5 of your last 7 years of work. Meaning if this contract passes as written and your fund ask for an increase and by virtue of the contract abf can not pay a higher contribution rate you will then be placed into a 401K ceasing your pension paid in time and if you did not meet the requirements you will be unable to receive any HEALTH INSURANCE from the plan when you retire. At today's rate if you were to try to buy health insurance comparable our's it would cost $1500.00 and up. And that is at today's rate. SO before you send in your ballots get informed. YOUR BROTHER ALWAYS! PLEASE INFORM OTHER'S! TurnCoat The IBT--Looking out for YOU...and...THEM! So...they won't be able to figure out how to separate the Health and Welfare portion from the Pension portion...hmm...I thought there was already laws on the books concerning that? If pension reform legislation is not passed, we're going to lose it ALL. Nobody but maybe You, Docker and few others actually believe ABF could...or even should...be expected to bail out the funds single handed. All the stock options that upper management received wouldn't even be a drop in the bucket. But, thanks for the info, if it's indeed correct, and it sounds legit, I'm qualified. albag and Rollin62 like this. Here is what a no vote will do for us. no vote will allow us to omit all pension fund language that could be catastrophic to us. We need to make the IBT go back to the old wording of the 2013 contract when it comes to the pension funds. It doesn't matter how good of condition your fund is in you will be at risk to be placed in default if this contract passes as written. There has not been increases in most funds since 2011 and not once did they inform us or ask us to vote on it. So why after 8 years are they now asking us to vote to freeze it? Because the only way they can throw us into default is if we agree to no increases then we ARE SCREWED! WE are not asking for more money we are asking to protect our futures as retired Teamsters able to receive reduced rate health insurance just as others in the past. But if we do not vote this contract down and demand changes in the current pension fund language that they have placed in this T/A we will surly suffer more than you can ever imagine. VOTE NO! SAVE OUR FUTURE'S! YOUR BROTHER ALWAYS! Skinnytrucker and troubleman84 like this. Nowhere can you find one post from Docker and I that wants abf to pay more than what is expected of them. NEVER HAVE WE EVER SAID abf SHOULD SAVE THE FUND! And as for you being glad you made the minimum requirements to get your health insurance but I am not surprised you could care less about the others that will not be so lucky if this contract passes. Why are you against not changing the language to protect this from happening to others? After all if there is no increase then it does not cost abf one more dime. But you are against even that. 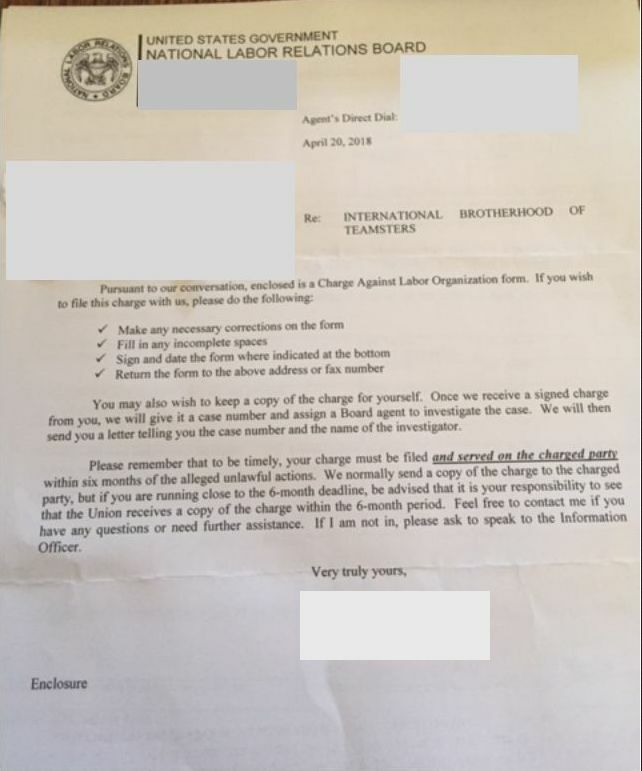 You are either management or you are the dumbest Teamster ever. A no vote makes them keep our pension language the same and protects our retirement insurance and I will not sit and watch it be taken for nothing more than a no cost language change. Now if you can't agree with that then you are the dumbest ever. Nobody but maybe You, Docker and few others actually believe ABF could...or even should...be expected to bail out the funds single handed. When did Ernie tell you that BS? Or was it those imaginary smart folks you keep talking about? How about asking either Ernie or those imaginary smart folks of yours... maybe they can answer those questions I've been asking you for days now. Well... here's one set of charges that have been filed... anyone know of anymore yet? And you think a No vote is going to make Central States change their rules? And I'm the dumbass?....well OK then, good luck with that. YES! All ballots will go to file 13. And start OVER! C'mon... I'm willing to give you some of that much needed attention you so desire so answer those questions and you'll get all you can handle. Yes... you are a dumbass... but that's been well established already. Preach bother muler.preach the gospel!!!!!!! Not changing the rules you really are dumb. That is the rules as I posted them. Where did you see anything about changing the rules. But yes I stand for what I believe in. You appear to be a weak man and that is your choice. You really did not red the last contract and thought they were putting $5.00 an hour into the fund. You really are not very bright or you are a low life that knew but kept misinforming Brother's and I believe you knew but misinformed. I read it, why did the union and the CSPF not demand it be paid....up to $5/hr in the last 5 years....the fund doesn't need it? They could have demanded it since the fund is in such dire straits and threatened to strike, or for that matter put us on strike until they coughed it up....couldn't they? Sure they could...it was in writing. But like I've said, before THEY can look out for YOU, THEY must first look out for THEM. Let's vote it down and see if that changes. I'm sure it will....NOT! I did not hear you tell everyone you have been wrong all this time in telling them about the contributions for the last five years. Are you real that dumb. They put that language in the contract so as to not rise the rate for abf for five years. They the union did that for abf against us. Voting NO is very easy! I think you left out some very important information for all the ABF guys here. They are only collecting the No votes this month, next month is when the Yes voters should log in! You don't get it right. In order to qualify for the insurance when you retire you have to meet the requirements through paying into the pension fund not the health fund. I posted the requirements. read them slo mo.AKA turnover.